Serbs are demonstrating ‘against the dictatorship’ of prime minister and soon-to-be president Aleksandar Vucic in the latest wave of anti-authoritarian protests to hit the Balkans. Protesters filled the streets of Serbia’s two main urban centers of Belgrade and Novi Sad last night to demonstrate ‘against dictatorship’, following the victory of Prime Minister Aleksandar Vucic of the ruling Progressive Party (SNS) in Sunday’s presidential election. The win will extend the powerful premier’s rule by five more years. 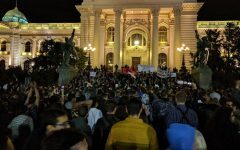 Several thousand protesters amassed in front of Belgrade’s parliament building, in front of the State Electoral Commission (RIK), and in the capital’s main Republic Square. Some congregated in front of the state television broadcaster RTS, or sat and blocked traffic on Svetogorska street in the city center. The seemingly spontaneous protests were reportedly first announced on Facebook. Prime Minister Vucic — that power-consolidating standard-bearer of Balkan stability — appears to have won Sunday’s presidential election easily with an astonishing 55.1 percent of the vote. Though protesters complained of a host of alleged electoral irregularities, most said they’d simply turned out because they opposed the fact that the prime minister had become president in an unambiguously authoritarian power grab redolent of Putin and Erdogan. All protests in the Balkans tend to be viewed with suspicion — sometimes fairly, sometimes not — as anti-democratic fifth column George Soros-funded affairs. 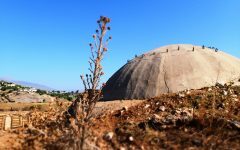 The government has certainly labeled them that way, and will continue to slander them as such in the press, however much Vucic might deserve the public’s discontented response to his consolidation of power. These types of protests are starting to acquire a sort of sameness: Macedonia recently experienced a series of anti-government protests collectively dubbed the “Colorful Revolution”. So far, it has proven unsuccessful. Most people in Serbia believe the protests will remain peaceful and ultimately flame out on their own. ‘[Vucic] learned his lesson in the 1990s not to use force,’ one protester explained to me. The demonstrations will unfortunately give the government more ammo to attack the ‘out-of-touch’ young urban elite who will be depicted as having been paid to protest by Soros and trained by the CIA, an integral narrative in Serbian national mythology dating back to the last millenium, and recently culturally appropriated by autocrats such as Donald Trump in the United States. So the protests in Belgrade and Novi Sad have also further highlighted the urban-rural divide in Serbia. While opposition candidates seemed to have received some campaign space in the capital, in smaller towns and the vast rural swath of the country, Vucic’s billboards have been disturbingly unavoidable. Second-place candidate and former Ombudsman Sasa Jankovic has been widely described as the candidate of choice in urban areas, and ultimately garnered 16.27 percent of the vote. Jankovic’s pre-election rally in Belgrade on March 29th drew an estimated 10,000 people. But at least for now, it’s difficult to imagine Jankovic pulling off proportionately-sized feats far beyond the country’s major regional capitals. That said, the protests that started in Belgrade and Novi Sad are supposed to spread to other cities and towns tonight. An informal schedule of demonstrations ‘against dictatorship’ is being circulated on social media. We’re reproducing it below. Tweet us your photos @balkanist!